Justice for All demonstrates that the Jewish Bible, by radically changing the course of ethical thought, came to exercise enormous influence on Jewish thought and law and also laid the basis for Christian ethics and the broader development of modern Western civilization. Jeremiah Unterman shows us persuasively that the ethics of the Jewish Bible represents a significant moral advance over Ancient Near East cultures. Moreover, he elucidates how the Bible’s unique conception of ethical monotheism, innovative understanding of covenantal law, and revolutionary messages from the prophets form the foundation of many Western civilization ideals. Justice for All connects these timeless biblical texts to the persistent themes of our times: immigration policy, forgiveness and reconciliation, care for the less privileged, and attaining hope for the future despite destruction and exile in this world. A wonderful work; insightful and important. Jeremiah Unterman never loses sight of the fact that the Bible’s goal is to create a holy, moral people. He convincingly demonstrates again and again that this is not just a modern reading of the Bible, but a statement of its original intent. Take notice. 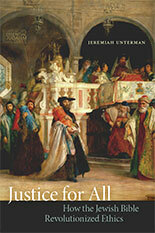 Jeremiah Unterman has written a major book that expertly documents the supremacy of the ethical in the Hebrew Bible. It will affect not only how you understand the Bible, but how you live your life. What makes this a particularly worthy contribution is its clarity and rigor, organized by topics that are so relevant today: how we treat the stranger, forgiveness, reconciliation, and repentance and redemption. The enduring value of this book is that it demonstrates the moral imperative that stands at the foundation of the Hebrew Bible and of Judaism. —Marvin A. Sweeney, professor of Hebrew Bible at the Claremont School of Theology and editor of The Cambridge History of Religions in the Ancient World,volume 1.